Glooko MeterSync Cable and the Glooko Logbook app. Founded and run by a team of people whose lives have been touched by diabetes, Glooko is on a mission to help people live life while effortlessly managing this disease. Studies and reports have shown that it’s possible to gain better control of your diabetes and become a better self-manager if you can understand and visualize the effects of your day-to-day activities. And our hope is that by using the mobile tools that are already integrated into your daily life, you can get the information you need to have the most productive conversations with the people in your care circle! Glooko’s breakthrough solution consists of the Glooko MeterSync Cable and the Glooko Logbook app. 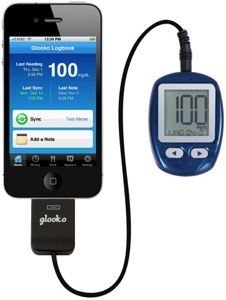 To use, simply plug the Glooko MeterSync Cable into most standard self-monitoring blood glucose meters and sync to an iPhone® or iPod® touch to automatically create a digital logbook of readings. It’s easy to review daily blood sugar levels, annotate them and share the results with a physician. 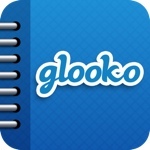 Glooko Logbook pulls the data already in your glucose meter(s) and creates an instant logbook on your iOS device. The app was designed for simplicity so you can efficiently add notes and review your readings anytime and on the go. • Create a consolidated logbook of all the data in your Glooko Logbook, including your blood glucose readings, meal tags, carbs, insulin, and comments – organized by date and time. • It’s automatically created when you import your Glooko Logbook CSV file from the app into Glooko Logbook History Report, an Excel spreadsheet downloaded at Glooko Logbook. • Quickly discover patterns at a glance by viewing your blood glucose readings in three charts: by time of day, by date, and by analysis by time of day. • Graphs and statistics are automatically created when you import your Glooko Logbook CSV file from the app into Glooko Logbook Charts, an Excel spreadsheet downloaded at Glooko Logbook Charts. Cancer survivors are sharing another diagnosis of considerable concern: that of developing diabetes. Not surprisingly, the intense treatment to fight the cancer may adversely affect areas of the body that become susceptible. As research continues to try to understand the reasons and support the argument with facts, it helps to know that there are a number of actions patients can take to control the situation. The disease of diabetes has two types with which most people are familiar. According to the US National Library of Medicine, diabetes affects the blood glucose levels, or the sugar in the blood. While glucose comes from what we eat, insulin is the hormone that the body produces to help convert the sugar into energy. With Type 1 diabetes, the body is unable to produce insulin. With Type 2 diabetes, the body is unable to produce insulin very well. Type 2 diabetes is the most common, and causes too much glucose to remain in the blood. Herein is where the problem lies. Excess sugar in the system is what does most of the damage to eyes, nerves and kidneys. However, stroke, heart disease, and the extremes of losing limbs are also linked to the disease. Initial symptoms may seem subtle with an increased thirst that tends to cause more frequent urination, also an increased in feeling hungry. When the disease has become serious enough, patients are able to control it with daily injections of insulin. Research has revealed that when the body undergoes radiation to fight the cancer, the risk of developing diabetes goes up to 90 percent. When it is considered that abdominal irradiation can damage the pancreas where insulin secretions occur and the sugars are metabolized, it becomes understandable that the treatment will have an adverse affect on this routine function. Theories also include the fact that radiation also affects the fat tissues in the body causing them to become resistant to the insulin hormone. It’s no small thing for the body to undergo irradiation. As a result, patients have a tendency to change their eating habits. With all manner of alterations such as a dry mouth and the sores that can develop, it is difficult to enjoy food. This is a common side effect experienced by those undergoing treatment for Mesothelioma. Increasing the fluid intake is a good idea; however, being careful to monitor the volume of sugars consumed is key. Drinking juices and other liquids that have some acidic content will stimulate the saliva production in the mouth, which will ease the discomfort. Drinks such as lemonade can be made with less sugar or even adding a twist of lemon or lime to water can help a lot. Freezing juice to eat, as popsicles is another way to enjoy some therapeutic relief. Patients with a Mesothelioma prognosis have developed the disease from the exposure to asbestos and other hazardous materials. Yet, diabetes and cancer conditions share risk factors, most significantly, poor diet that can lead to obesity and becoming physically inactive. Contrary to popular believe that cancer patients must be still in order to preserve energy for becoming well, the current thinking supports physical activity as it will help in overcoming the disease and play a role in preventing a relapse. Fitness and nutrition counselors can be of great help in making a plan to stay active and work toward maintaining a plan for life. Sugmet www.sugmet.com – Guest Blog. As a diabetic, I am constantly on the look out for new ways to make managing my diabetes easier. I generally look to the web for ideas. Sites like MyPump.co.uk, is a great way to discover products and resources available to those battling diabetes. Recently, I wanted a way to quickly record my sugar readings, either from my desk or on the go with my phone. When I did a search for an easy-to-use tool, I wasn’t satisfied with the selection available. The tools were either too complex (more features than necessary), too costly, or the sign-up was a little invasive. What I wanted was something quick, simple, and effective. So, as a Web Developer and a Type 1 Diabetic, I built my own tool. SugMet is the result. SugMet is designed to be effective at a couple of things. The first is allowing quick, easy and secure logging of your blood sugar measurements. It’s quick so you can squeeze it in anytime you take a measurement (and have an Internet connection), easy so you actually do log your measurement, and secure so you just simply don’t have to worry about anything. The second is providing you with a snapshot of your blood sugar control. A simple chart and summary give you a clear idea of how you are doing and what the trend is. Another important aspect about SugMet is that it is free to sign up and use! Tools like SugMet and sites such as MyPump.co.uk, are centered around helping those with diabetes take control and manage their lives easier. I hope you feel the same. I welcome you to register and start using SugMet today https://www.sugmet.com/register/ . Brent Pocker is a dad, husband, web developer, and type 1 diabetic. Funky Pumpers www.funkypumpers.com – Guest Blog. I am Sabrina Dawe and I live in Somerset UK. I have a 3 year old son and a 1 year old daughter. In September 2008, my son became very unwell – he was initially diagnosed with an ear infection but thankfully our GP called us back and did a fingerprick test. His blood glucose level was 26.4 and on arrival in hospital he was diagnosed as being diabetic and in severe DKA. He very nearly lost his life that day and spent a week in hospital recovering. When we left hospital he was put on MDI (Multiple Daily Injections). The 4 months he was on MDI were the worst 4 months of our lives. The amounts of insulin available were inappropriate for a baby and we found ourselves in hospital for much of that time with various health problems due to his blood glucose levels. At the age of 17 months, we were lucky enough to be referred to Leeds and obtain an insulin pump. This immediately improved both my son’s health and quality of life and we have not looked back since! As my son was only a baby on diagnosis, I had to give up work to look after him. Since then I have devoted my time to fundraising for JDRF and raising awareness. This year I am running the London Marathon for JDRF. I have also become a technology volunteer for Input, the insulin pump organisation. I sell insulin pump pouches which are trendy yet practical – they have great features such as a clear vinyl panels, so the pump doesn’t have to be taken out to deliver a bolus on a busy child! There will be profits given to JDRF, as I have not entered into this with the objective of making money for myself. I hope you enjoyed reading my story, hope to see you at http://www.funkypumpers.com/ soon!